As the latest surveys show, compliance continues to be one of the biggest challenges for companies that are relocating employees and their families. See our special Awards supplement in the Summer 2016 issue of Re:locate magazine on our Digital Issues page. Following record attendance at this year's gala dinner, the Relocate team is already hard at work to ensure we build on the success of the Relocate Awards 2015/16 and make next year’s even bigger and better. 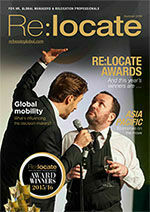 Promote your business: Sponsor the Relocate Awards. For more news and expert comment on all aspects of immigration, go to our Immigration section.